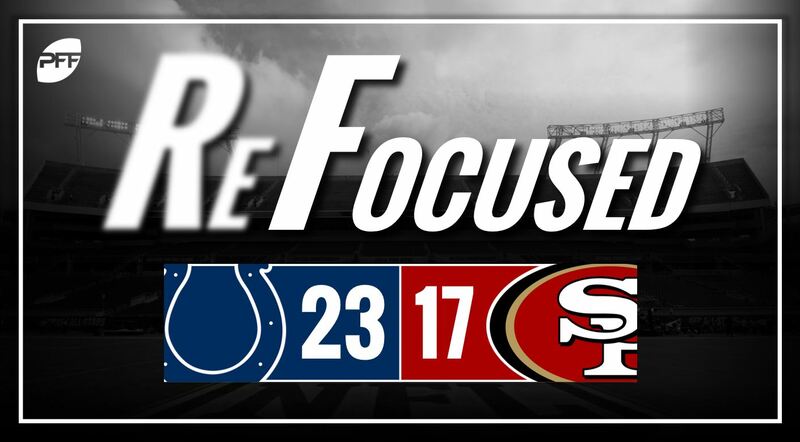 The Indianapolis Colts defeated the San Francisco 49ers on Saturday evening, 23-17, continuing the third full week of preseason action in the NFL. Christine Michael and Jordan Wilkins each stood out for the Colts’ offense. Michael consistently maximized runs and forced his way into the end zone from the 1-yard line for a touchdown late in the third quarter. Wilkins’ most impressive play of the game came when he caught a flare route and burst up the sideline for a gain of 29 yards on third down late in the fourth quarter. Andrew Luck had a standout performance in one and a half quarters of action. Luck started the game off by getting the ball out quickly and attacking the 49ers’ linebackers in coverage. His most noteworthy play came when he converted a third and long by scrambling for 22 yards in the second quarter. Luck’s one touchdown pass came on a ball up the seam to Eric Ebron. The Colts better hope their defense really steps up once the regular season starts because the 49ers had their way with them in the first half. San Francisco opened huge holes in Indianapolis’ run defense and made Alfred Morris look like a starting running back again. Edge rusher Ryan Delaire played like his hair was on fire in the second half, disrupting several plays during his limited time in the game. He had two sacks and forced a fumble late to help seal the victory. The 49ers’ linebackers had a rough day in coverage. Although there were a couple plays where the linebackers came up and made tackles for no gain in the passing game, they were caught out of position on two game-changing plays. One was on the touchdown pass from Luck to Ebron when Reuben Foster did not carry Ebron up the seam in the red zone. The other play involved Korey Toomer, who kept his eyes in the backfield when he was responsible for Wilkins in man coverage. This allowed a 29-yard gain late in the fourth quarter. Between DeForest Buckner, Arik Armstead, Solomon Thomas, and Jeremiah Attaochu, the 49ers’ pass-rush has a chance to be strong this season. Each of the aforementioned defensive linemen stood out, making impact plays in the backfield in the run and pass game. The 49ers’ first-team offense moved the ball quite effectively against the Colts’ defense. They were thwarted by four dropped passes and untimely penalties, so they could only score nine points while the Jimmy Garoppolo offense was on the field. Alfred Morris and the 49ers’ run blocking gashed the Colts for 84 yards, and Morris had five runs of at least nine yards. C.J. Beathard looked good guiding the second- and third-teamers completing seven-of-eight passes for 83 yards. Right tackle Mike McGlinchey was beaten several times and looked like a rookie. San Francisco: The 49ers moved the ball well but shot themselves in the foot too many times and settled for field goals instead of touchdowns. The first-team Colts defense had a hard time stopping the 49ers early on. Indianapolis: Standout performances from Luck and his backfield (i.e. Michael, Wilkins) were key in the Colts’ 23-17 win over San Francisco. But, more importantly, Indianapolis’ core offensive pieces surging in the dress rehearsal before the regular season is a good sign for a franchise plagued by Luck’s absence in recent years.